Samsung 850 EVO is a great SSD drive at an affordable price for consumer. How to clone Windows 7/8/10 OS to Samsung 850 EVO SSD drive? Try AOMEI Backupper Professional to clone OS/HDD to Samsung SSD 850 without reinstalling Windows and applications. In the view of the high cost and lower capacity of SSD drive, many people will consider use a larger traditional hard drive (HDD) instead of SSD drive to speed up computer. Thus, Samsung pronounced release a series of SSDs for consumer, including Samsung SSD 960 Pro, Samsung SSD 960 EVO, Samsung 950 Pro, Samsung 850 Pro, Samsung 850 EVO, Samsung 750 EVO, etc. Nowadays, Samsung solid state drive (SSD) is widely used in desktops and laptops. Samsung 850 EVO SSD drive was released in 2014, and delivers great performance and endurance at an affordable cost. Samsung SSD 850 EVO can fulfill the demands for users on capacity, like 250GB, 500GB, 1TB, 2TB, 4TB, etc. Why Clone HDD/OS to Samsung 850 EVO SSD Drive? Take into account the strengths of Samsung SSD 850 EVO, a vast majority of users would like to replace the hard drive (HDD) with the Samsung 850 EVO SSD drive to speed up computer. Therefore, you may plan to migration OS to Samsung 850 EVO SSD, or clone all files to Samsung 850 EVO SSD to get a short boot time, faster speed of reading and writing, etc. 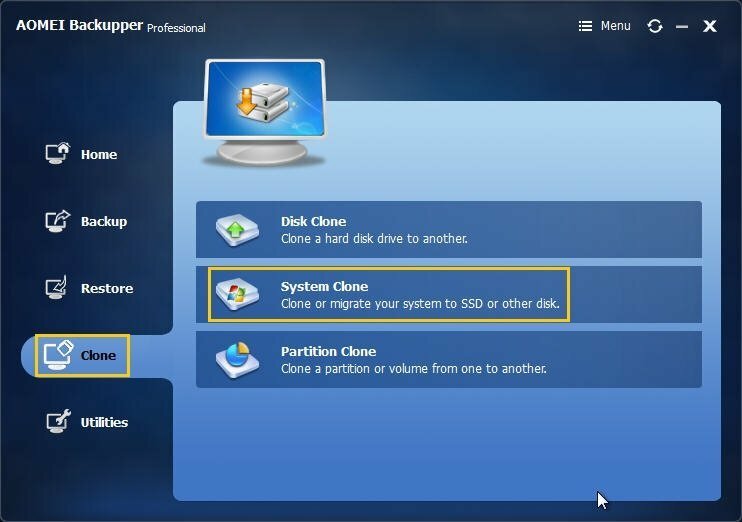 How to Clone to Samsung 850 EVO SSD drive without reinstalling Windows and applications? First of all, you can download the best samsung ssd 850 evo data migration software - AOMEI Backupper Professional, which makes you clone OS/partition/hard drive to Samsung SSD 850 EVO easily and safely in Windows 7/8/10. How to Clone to Samsung 850 EVO SSD Drive without Reinstalling Windows? First, install and execute the Samsung EVO migration tool - AOMEI Backupper Professional, click Clone at the left panel, Then System Clone. Secondly, select the Samsung 850 EVO SSD drive to save the Windows OS from HDD, hit Next. Tips: The program will automatically detect the system partition associated with system files. Last, click Start Clone. Before that, make sure you have checked the Align partition to optimize for SSD option. Tips: You can also tick Sector by sector clone if your Samsung 850 EVO SSD is larger than your current hard drive (HDD). Wait for a few minutes, migrate OS to Samsung 850 EVO SSD will be finished. And you have to figure out the cost time will depends on the data size. On the other hand, AOMEI Backupper Professional allows you to clone HDD to Samsung SSD 850 EVO drive/USB/NAS device/cloud, sync file to cloud, command line backup, dissimilar hardware restore, create differential and incremental backup, and many more.